Life is complicated. We have bills to pay, families to tend to, chores to do, jobs to work, things to do, places to go… Parents like to say they feel more like a taxi cab service than they do anything else, always running from one thing to the next. Solomon’s Ecclesiastes gives us a different look at life. It is neither blindly optimistic or fatalistic in pessimism. Solomon tells the truth about this life–it is hard and sometimes the wicked seem to do better than people interested in doing right. But that’s not all there is to life! God gives us hope and meaning and a way to make it through. Ecclesiastes is a famous—maybe the world’s most famous—witness to this experience of futility. The acerbic wit catches our attention. The stark honesty compels notice. And people do notice—oh, how they notice! Nonreligious and religious alike notice. Unbelievers and believers notice. More than a few of them are surprised to find this kind of thing in the Bible. But it is most emphatically and necessarily in the Bible in order to call a halt to our various and futile attempts to make something of our lives, so that we can give our full attention to God—who God is and what he does to make something of us. Ecclesiastes actually doesn’t say that much about God; the author leaves that to the other sixty-five books of the Bible. His task is to expose our total incapacity to find the meaning and completion of our lives on our own. It is our propensity to go off on our own, trying to be human by our own devices and desires, that makes Ecclesiastes necessary reading. Ecclesiastes sweeps our souls clean of all “lifestyle” spiritualities so that we can be ready for God’s visitation revealed in Jesus Christ. Ecclesiastes is a John-the-Baptist kind of book. It functions not as a meal but as a bath. It is not nourishment; it is cleansing. It is repentance. It is purging. We read Ecclesiastes to get scrubbed clean from illusion and sentiment, from ideas that are idolatrous and feelings that cloy. It is an exposé and rejection of every arrogant and ignorant expectation that we can live our lives by ourselves on our own terms. Join us as we spend ten weeks working through this powerful and unusual book of the Bible. 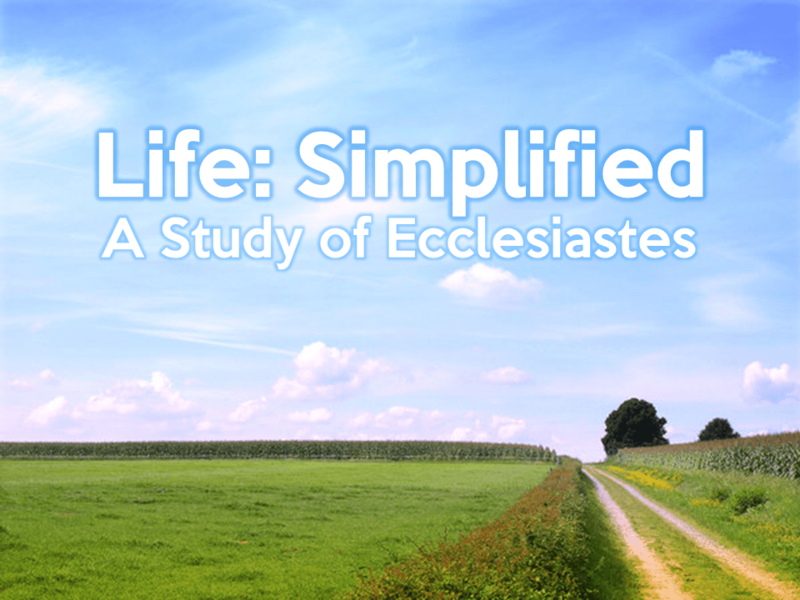 Ecclesiastes: Life, Simplified: Ecclesiastes 12:11-13 (Ecclesiastes: Life, Simplified) by Matthew Hiatt on June 28, 2015. Been There, Done That: Ecclesiastes 1:1-14 (Ecclesiastes: Life, Simplified) by Matthew Hiatt on July 5, 2015. The Pursuit of Happiness: Ecclesiastes 2:1-12 (Ecclesiastes: Life, Simplified) by Matthew Hiatt on July 12, 2015. Workin' Nine to Five: Ecclesiastes 2:18-26 (Ecclesiastes: Life, Simplified) by Matthew Hiatt on July 26, 2015. Tick, Tock: Ecclesiastes 3:1-15 (Ecclesiastes: Life, Simplified) by Matthew Hiatt on August 2, 2015. Something Stinks: Ecclesiastes 3:16-4:4 (Ecclesiastes: Life, Simplified) by Matthew Hiatt on August 9, 2015. Money and Relationships: Ecclesiastes 4:1-7:1 (Ecclesiastes: Life, Simplified) by Matthew Hiatt on August 16, 2015. Wisdom 101: Ecclesiastes 7:1-11:1 (Ecclesiastes: Life, Simplified) by Matthew Hiatt on August 23, 2015. God is God: (Ecclesiastes: Life, Simplified) by Matthew Hiatt on August 30, 2015. Now is the Time: Ecclesiastes 11:1-12:14 (Ecclesiastes: Life, Simplified) by Matthew Hiatt on September 6, 2015.